The year is 1936. Nazis are sweeping through North Africa and the Middle East excavating tombs and pillaging archaeological dig sites for mysterious artefacts. The only way to stop them is through a choose-your-own-adventure-style strategy game where death comes swiftly and often. While upcoming game Pathway doesn’t nail things perfectly, its juicy pixel animations and roguelite-like progression make it hard to put down. 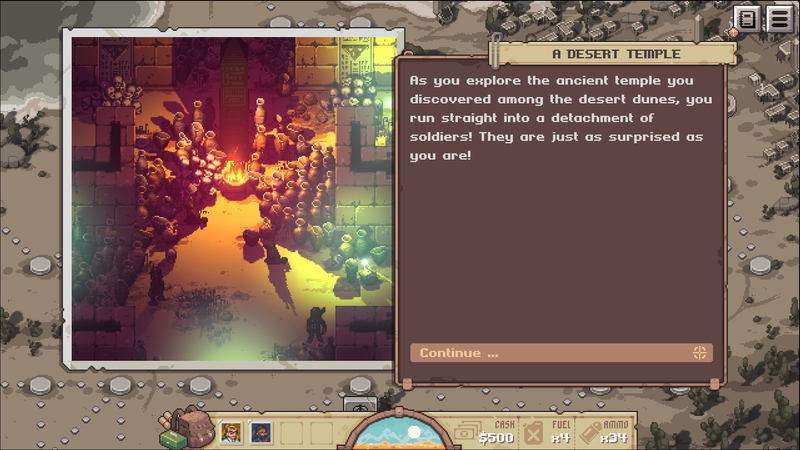 Pathway lives up to its Indiana Jones inspiration, focusing on smaller melees rather than large scale battles. Set to release 11 April on PC, Pathway sports a beautiful art style that’s retro-looking but with modern flourishes, including dynamic lighting that bathes its various desert locales in lively contrasts. Players explore a map made up of individual nodes, each containing a potential fight, trading post, or interesting narrative development, similar to 2012’s FTL: Faster Than Light. 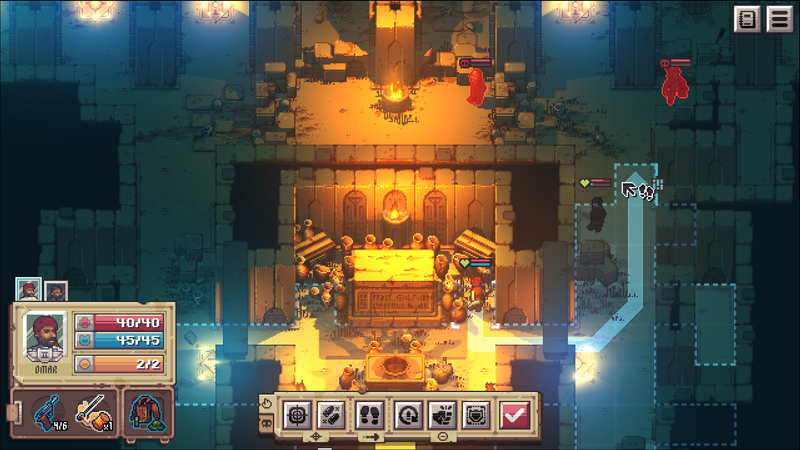 During combat, things switch to a turn-based grid system, with characters trading gunshots with Nazis and taking cover similar to the XCOM series. 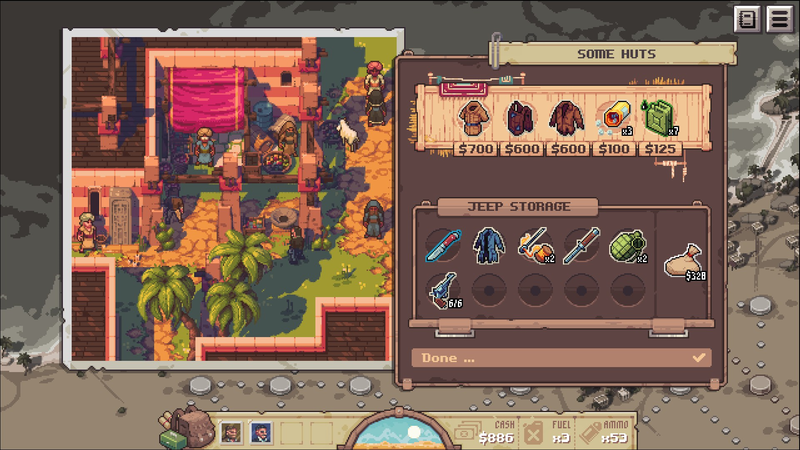 When everyone dies, instead of a “game over” screen, things start back at a camp where the player can set out on a new adventure with everything from the previous attempt, including loot and experience points, carrying over. Pathway doesn’t cobble these disparate influences together seamlessly, but it does do a pretty good job considering how ambitious the mix is. The game consists of five different expeditions, each of which gets unlocked after the previous one is completed. They get quite involved, and while the final encounter in each is predetermined, the rest is procedurally generated. As a result, each expedition feels like a playground for levelling up your characters and discovering new secrets rather than a linear set of missions to get through. Before setting off on one of these adventures, you select the people you want to take out in the jeep with you. Some specialise in medicine and can use medkits to heal your party while out in the field. Others can lob grenades or do bonus damage when attacking with knives. In this way, every character is unique, not just in appearance and backstory but also in the strengths and weaknesses they bring to your team. For instance, Miguel is a leather jacket-wearing poet on loan from the Spanish Civil War who wields a Stahlknecht STG-34 and does extra damage against Nazis, while Prince Omar Abu al-Jarabi is an art collector who can equip lots of different weapons but is weak against the undead. At first your party is limited to two characters, but later on you can use up to four out of a total roster of 16. Once out in the field, your gear is limited to what you can fit in your jeep and the current amount of petrol and ammunition you have on hand. Travelling to a new node on the map spends one canister of fuel, while each shot during combat comes out of the overall ammo stockpile for the adventure. This limits how much you can explore during a single attempt and encourages avoiding fights where possible in order to make it to the final objective with enough resources. During enemy encounters you place your characters onto a grid and then take turns trying to out-manoeuvre your foes, including Nazis, cultists, and other factions. 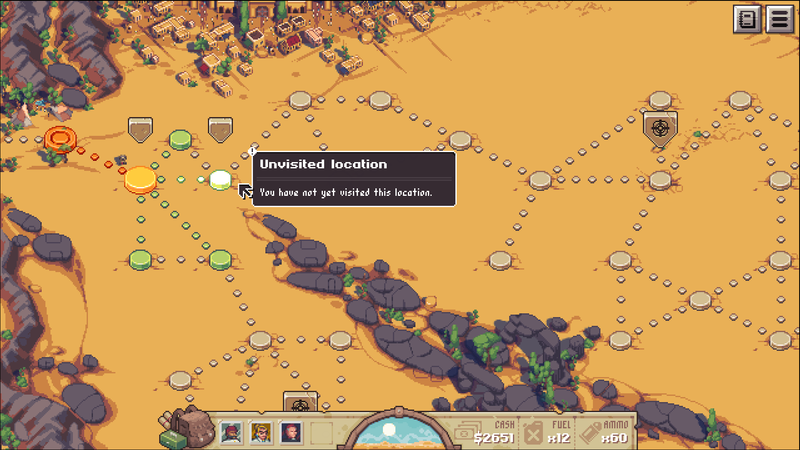 A fog of war hides enemies until they come into range, and being behind different levels of cover will affect the likelihood of a shot landing. Since most characters die within a few hits, it’s important to use stealth and cover to even the odds. In this regard Pathway lives up to its Indiana Jones inspiration, focusing on smaller melees rather than large scale battles. At first combat felt unforgiving. Since there’s no healing between fights unless you have medkids and someone who can use them or happen to discover a campsite, I kept dying within the first few fights of an expedition. As I started to get smarter about my team compositions and positioning on the battlefield, it all started to snap into place. After a few hours I felt like I had some winning tactics and a good base of resources to continue building off of. That’s when the game really started to open up, and I began to see just how many hours I could potentially pour into building up my crew and finding the strategies for taking on the harder adventures. Where Pathway falters is in its storytelling. Though I’m only five hours in, some of the random encounters generated in each outing have come to feel repetitive. I have yet to discover any major side quests that help build out the game’s World War II-era world. It’s satisfying to kill Nazis, but conflict rarely goes deeper than that. And though the roster of characters is diverse, there are times when Pathway treats places like Casablanca and Jerusalem like Hollywood backdrops rather than locales with their own struggles and histories. If there is more to Pathway’s period setting than an excuse for exoticised globetrotting, I haven’t found it yet. That hasn’t stopped me from being won over by its elegant re-organisation of the conventional strategy role-playing game and its wonderful presentation, including a stellar soundtrack by composer Gavin Harrison, who also created the music for developer Robotality’s previous game, Halfway. Good strategy RPGs are rare these days, and rarer still are ones that weave together so many disparate elements as effectively as Pathway does.